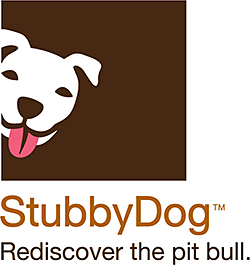 StubbyDog, a non-profit organization founded in 2011, has been tirelessly working to debunk the negative myths and misinformation about pit bulls by changing the conversation to focus on the positive qualities of the dogs. A pit bull is not one breed of dog. Instead, “pit bull” is the name commonly given to several breeds that resemble each other, including American Staffordshire Terriers and American Pit Bull Terriers. The StubbyDog website and social media platforms offer numerous stories of pit bulls as heroes, athletes, therapy and rescue dogs, and, perhaps most importantly, as everyday, ordinary, lovable, loyal family pets. In the past couple of years, StubbyDog has shifted its focus to community outreach efforts to prevent or overturn breed-specific legislation (BSL). BSL is the umbrella term for laws passed at the state or local level that restrict or ban certain breeds in the hopes of reducing dog attacks. Not surprisingly, the erroneous information that has falsely branded pit bulls as dangerous dogs, has led to pit bulls, and any dogs that resemble them, being a prime target of BSL in some parts of the country. 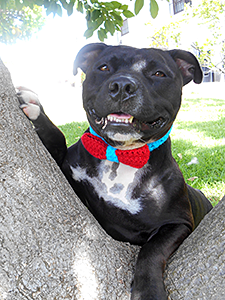 Under Bolanos’s leadership, StubbyDog is empowering individuals to attend local council and board meetings and speak up on behalf of pit bulls and against BSL. The website offers individuals and local communities a packet of information about pit bulls, animal behavior, dog bite statistics, and much more that they can share at these meetings. There are also talking points available on how to present information at a meeting in a brief, measured, efficient, and professional manner. Bolanos is happy to report that BSL has been losing momentum and is even being overturned in places were it had existed. Apparently, several key studies, including one conducted by an American Veterinary Medical Association Task Force for the Center for Disease Control have shown that BSL has had no impact on reducing the number of dog bites or attacks. In addition, in a 2013 statement, the Obama administration came out against BSL. Today, no statewide BSL exists and, in fact, 17 states have laws that prohibit BSL from being enacted at the state level (including New York and Florida). In addition to its on-going anti-BSL advocacy, according to Bolanos, StubbyDog receives numerous e-mails from people in situations where they might have to surrender their dog due to behavioral issues, high veterinary bills, or simple prejudice against the breed. They intercede on a case-by-case basis, holding fundraisers for medical bills, locating local trainers to help with any behavioral concerns, and even speaking directly to landlords about housing issues. Bolanos tells about one family that had a high-energy pit bull and lived in an apartment complex. The dog was not aggressive but the stereotype against pit bulls and the dog’s demeanor nevertheless caused a few residents to be frightened when they saw the dog. The family lived in an area where, according to the local law, if the dog did attack someone and, for any reason they could not pay any attendant costs, then their landlord would be held liable. The landlord wanted the family to either move or get rid of the dog. The family contacted StubbyDog and the organization paid for behavioral training for the dog. In addition, they advised the family to offer the landlord a sizable deposit against any liability. As a result of these actions, the dog was able to remain in the home and no incidents have ever occurred. As StubbyDog moves forward, Bolanos says, “an area of focus will be to build community awareness for the breed in the South.” Toward that goal, she is excited to report that in early October, StubbyDog, for the first time, will be partnering with the Sula Foundation in presenting one of the Foundation’s low-cost spay/neuter and vaccination clinic in New Orleans. While both organizations focus on pit bulls, any eligible pet will be welcome to the services offered. StubbyDog also has a Crochets for Spays initiative, whereby crocheted items for pets and people to wear (everything from canine bowties to crocheted floral hair bands for women) are donated to the organization for sale. One hundred percent of the proceeds go into the organization’s spay and neuter media campaign. 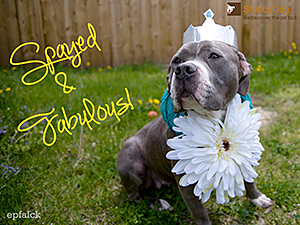 In recognition of its work to present the positive points about pit bulls, in July 2014, StubbyDog received the Broadway Barks Award at Broadway Barks’ (an organization founded by Mary Tyler Moore and Bernadette Peters) annual adoption event held in Shubert Alley in New York City. “It’s wonderful to save one dog at a time,” says Bolanos, “but to also be instrumental in passing laws that saves thousands of dogs feels great!” In its relatively few short years of existence, StubbyDog has managed to do both those things. Sergeant Stubby is perhaps the most decorated pit bull mix of all time. 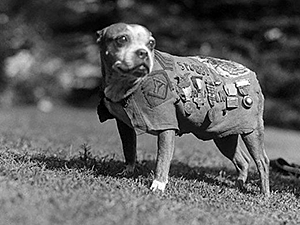 Here he is wearing his army coat and medals from his service in World War I.
StubbyDog is named in honor of a pit bull mix named Stubby who became a decorated World War I war hero after starting his life as a stray. Stubby’s owner, an American soldier, took the dog with him when he was deployed overseas and Stubby served with the 102nd Infantry Regiment in France for well over a year. After the war, Stubby received many honors and met three United States Presidents. He is a shining example of how special a pit bull mix — or any dog — can be.